I like chocolate mousse, but J does not. I'm not sure how that's possible, but there it is. As a result, I never make it, despite having many many recipes in French cookbooks, magazine cuttings and internet posts. 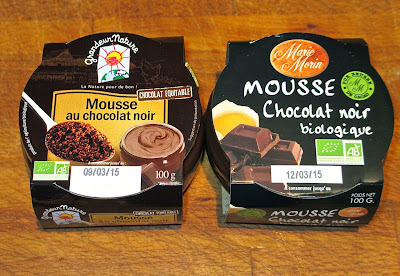 One of my guilty pleasures in Paris, especially when I'm here alone, is the organic dark chocolate mousse that can be found at Monoprix and at bio (health food) stores. The amazing thing, for a store-bought product, is the list of ingredients: chocolate (42%), eggs, butter. That's it, no preservative, thickener, gelling agent, stabilizer. Well, perhaps the most amazing things are really the taste and texture, which are excellent and quite adult. (The mousse is so thick that it's actually hard to clean your spoon, either with your mouth or in the sink.) Or maybe I just become a child again when I eat them. 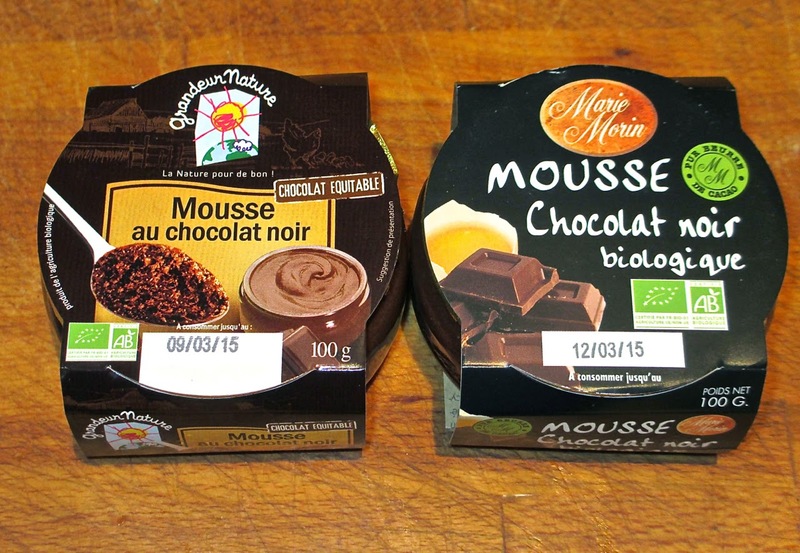 When in Paris, go to a supermarket and buy one to keep in your mini-fridge in case of emergency.